This story originally appeared in The Philadelphia Tribune. Parking lot workers make poverty wages as the industry rakes in profits in Philadelphia, according to a new report. The bulk of the private industry’s workforce in the city is Black, workers earn a median wage of $9.50 an hour and the majority lack benefits, according to the nonpartisan Keystone Research Center’s report that surveyed 143 workers. 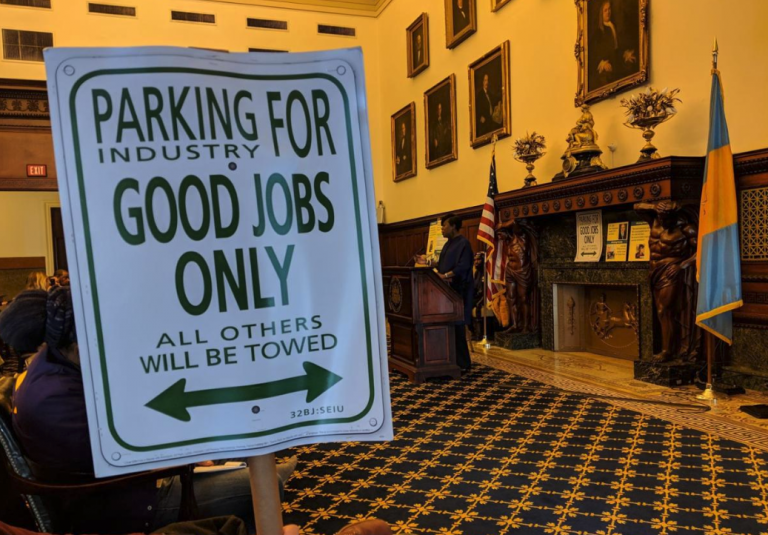 The industry earned an estimated $453 million in revenue in 2018, according to the report “Parking Industry Fuels Poverty in Philadelphia.” The report suggested that raising wages would lift these workers and their families out of poverty and reduce employee turnover. 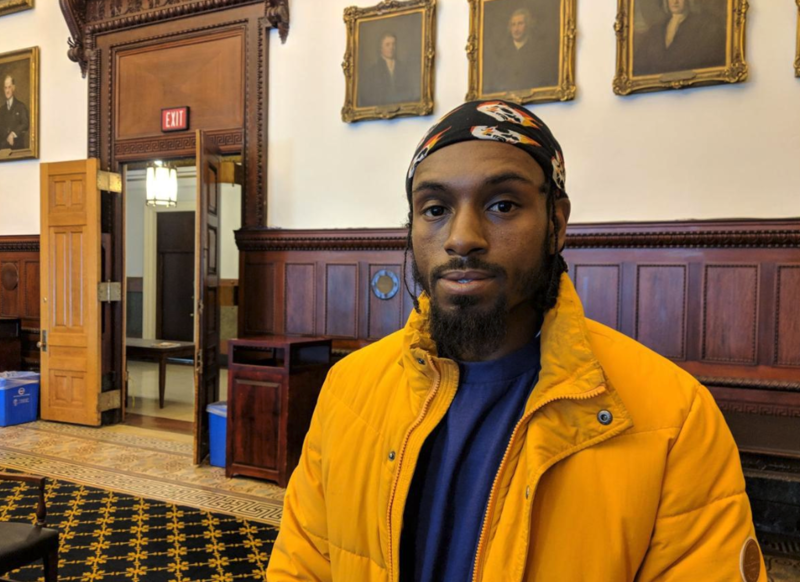 “Their profits should not depend on our poverty,” said West Philadelphia resident Michael Hardaway, 27, who was fired from his job at a Center City parking garage for attempting to unionize fellow employees. Stephen Herzenberg, executive director for Keystone Research Center, released the report Tuesday inside the Mayor’s Reception Room in City Hall alongside Hardaway; Daisy Cruz, district director for SEIU 32BJ; Rodney Muhammad, president of the Philadelphia chapter of the NAACP; Councilwoman Cherelle Parker; and others. Brian Lipkin, executive vice president for Bala Cynwyd-based Park America which operates approximately 30 parking locations in the city, said he was not aware of the report, but blamed Philadelphia’s high tax rates for keeping employee wages low. Park America employees, some of whom are unionized, earn between $10 and $11 an hour plus tips and are offered benefits, Lipkin said. Any rise in rates to pay workers or increase benefits more would drive away customers, he warned. The findings from the report were based on the survey of parking garage workers — valets, lot attendants, cashiers, drivers, and supervisors — that was conducted in late 2018 and earlier this year. Keystone Research Center partnered with SEIU Local 32BJ to conduct the survey. Herzenberg said the parking industry’s “poverty jobs” reinforce racial inequities. Herzenberg, who authored the report, said lifting these workers out of poverty requires a base pay of at least $15 an hour and benefits. 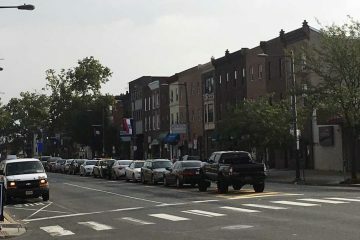 The 9th District councilwoman introduced legislation this month to hold hearings to examine the wages of parking workers. A hearing has yet to be scheduled. Philadelphia’s private parking garage industry is made up about 10 companies, according to the report. Impark/ParkJockey was estimated to employ the highest number of workers in the city, followed by Park America and LAZ Parking. To make a modest living in the Philadelphia region, a family of four needs to earn more than $92,000 a year, according to the nonpartisan Economic Policy Institute, a nonprofit think tank. Philadelphia public employees and contractors are on track to earn a $15-an-hour minimum wage by 2022. The city cannot increase minimum wage for private workers without the approval of state legislators in Harrisburg. While Gov. Tom Wolf, a Democrat, has advocated for hiking the minimum wage from the $7.25-an-hour federal minimum, the Republican-controlled legislature has been slow to act. 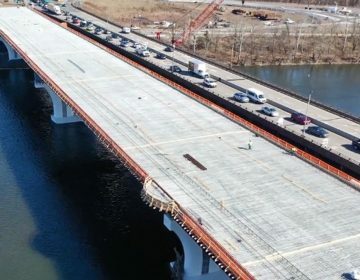 “We need something to happen faster for the parking lot attendants, so this local pathway to middle-class living, middle-class earning can put you in a position for middle-class living: That’s a union,” Muhammad said. Cruz, the district director for SEIU 32BJ, said unionizing workers would lead to higher wages and better benefits for employees, and help businesses by reducing turnover. She estimated that a third of all parking lot attendants were already unionized. Lipkin, of Park America, said Philadelphia’s ever-increasing taxes, including real estate taxes and the 22.5 percent city parking tax, accounts for approximately 50 percent of the revenues generated by garages and lots operating in the city. In contrast, the Philadelphia Parking Authority pays its public, unionized garage workers $17.57 an hour, and provides them with health coverage, sick-leave, and vacation time. Hardaway, the Center City parking lot attendant who lost his job, predicted that winning any concessions from the industry will be a battle.